The annual festival of Cybele, the Megalesia, was celebrated on this date in ancient Rome. 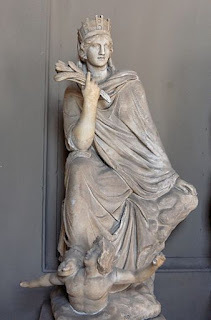 She was a goddess of fertility whose cult originated in Phrygia. Her male attendants were self-castrated priests and worship of her was wild and orgiastic. The rites of Cybele were so bloody that Roman citizens weren't allowed to participate. "So great is the aversion of the Romans," writes Dionysus of Halicarnassus, "to all undue display...lacking in decorum" that a more sedate festival, the Megalesia, was instituted. But by 161 B.C.E Megalesian banquets had become so extravagant that the senate decreed a limit to how much a host could not weigh more than 120 pounds. The roman Megalesia opened with a ritual at the temple of the Magna Mater (Cybele)., where the priests offered the goddess a dish of simple herbs. This was because, as Ovid wrote, ancient people drank only pure milk and ate only "the herbs that the earth bore of its free will."